Los Angeles is more than a city. It’s a vast conglomeration of towns and cities that grew together into one mass, the Southern California Megalopolis. Its sheer vastness may work against its reputation as a tourist destination because it is so vast and diffused that it is hard to get a focus on it. Greater Los Angeles is a country to itself, far more than you could hope to take in without spending years there. Nevertheless, here is a small selection of things that are worth checking out when you are there. L.A. has hundreds of museums, more than you could take in in a lifetime, but one place to start is The Getty Museum, which offers not only a great selection of paintings and sculpture, but also one of the best views of Los Angeles available from the ground. The museum has some beautiful paintings by Van Gogh, including his famous “Irises” as well as one of his earlier, brownish Northern paintings, “Loom with Weaver.” The collection also includes some Gauguin, Renoir and Degas pieces, a variety of 18th and 19th century paintings and 19th and 20th century photographs and some racy surprises, such as “Three Lovers” by Théodore Géricault from about 1820. The $1.3 billion complex is an architectural beauty and the vast and elaborate gardens on the grounds are worth a visit in themselves. The Grammy Museum salutes the recording industry and the power of music as a cultural force with four floors packed with interactive exhibits and artifacts. Exhibits include Songwriters Hall of Fame Gallery, Enduring Traditions and Crossroads, an interactive exhibit through which you can explore 160 genres of music. The museum also keeps up a steady flow of temporary exhibits, such as "Ringo: Peace and Love," which opened June 12, 2013, and was recently extended through April 27. The exhibit includes his drum kits from Abbey Road studios and the Ed Sullivan show, as well as his uniform from the Sgt Pepper cover and lots of other wacky memorabilia, including letters and photographs. An exhibit opening May 8 will spotlight L.A.’s own Laurel Canyon and the odd assortment of musical talents who converged there in the late '60s and early '70s, including Joni Mitchell, Steven Stills, James Taylor, Carole King, Jackson Brown, and Mickey Dolenz. For a noncommercial outing, with no entrance fee, Runyon County Park offers an immersion in the real life of some of the real people in Los Angeles. Here at 2000 N. Fuller Drive, where the streets of Hollywood bump up against the Hollywood Hills, is a great 130-acre park just two blocks from Hollywood Boulevard on the east end of the Santa Monica Mountains. Angelenos gather in this urban wilderness to unwind from the city and walk its long canyon-edge paths. You can hike up Indian Rock to the highest point in the park and take in 360-degree views that include Hollywood, Greater Los Angeles beyond, the Griffith Observatory, the Hollywood sign and on a clear day, the Pacific beyond Santa Monica. 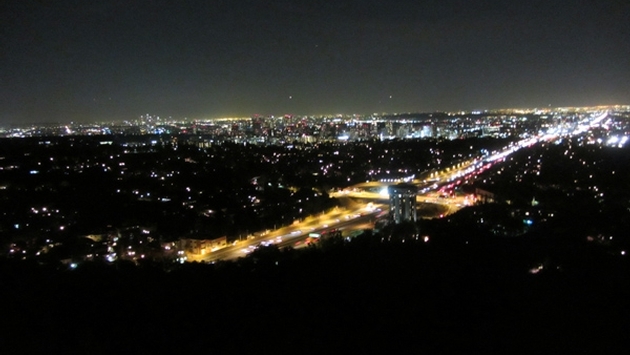 For a plethora of hiking locations in Los Angeles, see Discover Los Angeles. Of course Los Angeles has the original Disneyland, now known as Disney’s California Adventure Park, and Six Flags, as well as the original Universal Studios attraction, which is not only a theme park with rides but also is the site of the original Universal Studios opened in 1915 to make movies. Founder Carl Laemmie invited the public in from the beginning to watch silent films being made. Today you can still get a behind-the-scenes look at how movies are made, as well as ride on any of the mind-bending or nerve-shattering rides such as Transformers: The Ride 3D or Revenge of the Mummy. No trip to LA would be complete without a visit to the beach. There are many to choose from, including Venice, Manhattan, Redondo, Santa Monica, Hermosa, and Las Tuna beaches. A little farther out than many of the beach areas, Malibu is a cool respite from the hot summer days in inner Los Angeles. Malibu has a number of beaches, including Surfrider Beach, Zuma Beach, Malibu Beach, Topanga Beach, Point Dume Beach and Dan Blocker Beach. Surfrider Beach, or officially Malibu Lagoon State Beach is surrounded by breathtaking mountain landscape views and is a favorite of surfers for the perfect swells created by Malibu Point. It’s a good spot for swimming, sunbathing, picnicking, bird watching and fishing.